Consumers might not be ready for aisles of festive wintery decorations inside of their favorite stores, but believe it or not, the holiday shopping season is almost here. So while you’re putting some finishing touches on your Halloween costume, you should also be thinking about your holiday marketing campaigns. New data from Marin Software has shown that while brands traditionally go heavy on advertising in December, you’ll see a more significant return on investment two weeks before Thanksgiving. Consumers are starting their shopping earlier and earlier every year. Is your marketing strategy ready? Here are some holiday marketing tips to consider before launch. According to an AOL Advertising survey of holiday shoppers, more than half admitted that advertising impacted their decision-making processes. In fact, 30 percent said advertising reminded them to purchase holiday items, while 18 percent said it made them more likely to purchase because of an advertised deal. How can you improve this year’s outcomes? Apply what you learned last year to your upcoming holiday campaign. Even a few small tweaks could have a major impact on this year’s results. Social media platforms are constantly evolving and, as a result, so are their features and guidelines. This year you might have a new feature pool to choose from, updated image sizes to adhere to, or an entirely new social network or app to utilize. As marketers, you need to be aware of these changes and understand how they contribute to your upcoming holiday campaigns. In addition to our always up-to-date social media image sizes guide, here are some of 2014’s social network highlights and guides. Last year’s biggest piece of holiday marketing advice encouraged brands to “go mobile.” This came from Facebook, which also reported that more than 100 million people access the social network from mobile every day in the U.S. alone. That number has since grown to 654 million as of June 2014, which only strengthens the importance of this tip for the upcoming season. According to Google, 52 percent of online smartphone shoppers used their phones throughout the shopping process during the 2013 holiday season. As marketers, the biggest mistake you can make this holiday season is not optimizing your campaign for mobile. This includes everything from your website and email newsletter to the content and ads you share across social networks. Whether you’re directing shoppers back to your website, landing page, or social profile, make sure that every click is optimized for mobile. More importantly, don’t send your customers on a digital scavenger hunt in order to access critical details like price and availability. From Buy buttons to Rich Pins, social networks are giving marketers better tools to engage shoppers across devices and it’s time to start using them. The holidays can be a crazy time for businesses both big and small, but they don’t have to be. Even if you don’t have a global brand bandwidth or budget, there is still plenty of opportunity to go big this holiday season. Whether you’re launching ad campaigns or engaging in a themed social conversation, everything you do comes back to customer care. 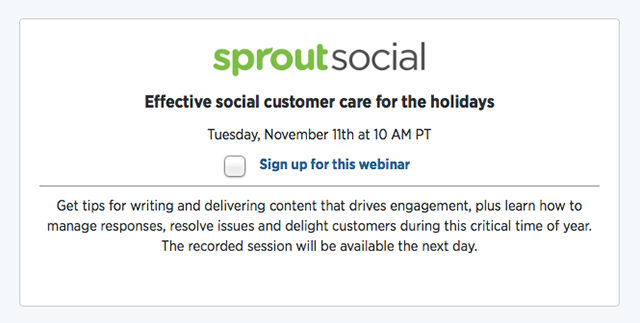 Join Sprout Social on Tuesday, November 11th at 10 a.m. PST for our Effective Social Customer Care for the Holidays webinar. Click here to sign up. We’ve teamed up with Twitter and the Google Small Business Community to deliver tips on writing and delivering content that drives engagement, in addition to helpful hints on how to manage responses, resolve issues, and delight customers during this critical time of year. Updated 11/13/14: If you missed it, or if you’d like to re-watch, you can click here to download the webinar.